The average person in this digital age has files everywhere. Luckily, using Cacoo with different file storing platforms has never been easier. 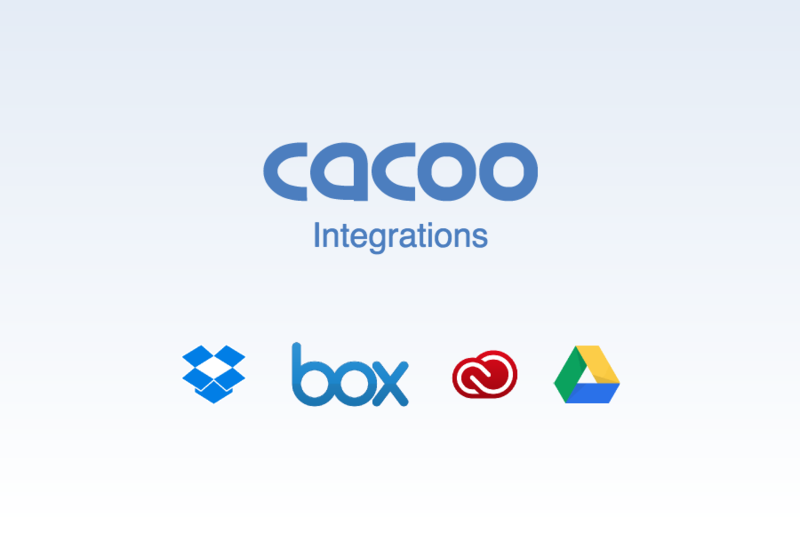 There are now 6 Cacoo integrations that will allow you to access and share your files directly within Cacoo’s editor. So sit back, relax, and get ready to take your Cacoo experience to the max. With these 6 integrations, you’ll rarely have to leave your interface ever again. In our latest product update, you may have heard about our new Google Docs Integration. This tool allows you to access your Cacoo diagrams directly from Google Docs. All you need to do is download the free Google Chrome add-on. From within your document, click the “add-on” drop-down and select “Cacoo Diagrams.”Log-in to your Cacoo account to complete the process, and you’ll be able to easily insert any diagram into a Google Doc. With Cacoo’s Dropbox integration, you can quickly import any file from your Dropbox account. Select the Dropbox icon from the attachment drop-down menu and a pop-up window of your Dropbox account will appear with all of your files to choose from. The first time around you will have to sign in, but after that, your files are just a click away. Cacoo’s Box integration works just like Dropbox. Once you select the Box icon from the drop-down menu, your files will appear in a pop-up window. If you work a lot with Adobe Illustrator or Photoshop, you’ll feel like you’re on Adobe Creative Cloud 9 when you take advantage of Cacoo’s Adobe Creative Cloud integration feature. Instead of having to export your Adobe files to supported ones, this integration allows you to import files to an expanded list of supported file types including PDF, AI, PSD, EPS, TIFF, GIF, PNG, SVG and JPEG right from your Creative Cloud Assets to Cacoo. Select the Adobe icon in the attachment drop-down menu, and you will be directed to your Creative Cloud Assets pop-up folder. The Confluence and Cacoo Integration allows for a smooth import of Cacoo diagrams with just a few steps. Download: Log-in to your Confluence account as an admin, click on the gear icon in the top right corner, and navigate to the add-ons page to download the “Cacoo for Confluence Server” add-on. Insert More Content: Once this is installed, you can import a Cacoo diagram onto your page by opening the “insert more content” drop-down menu, selecting “other macros,” and choosing the option for Cacoo. Add URL: Pop on over to your diagram page in Cacoo to copy the specific diagram URL, return to Confluence and paste that URL, and finally click insert. We are always working to improve the Cacoo user experience. So please keep checking back to our integrations page for more updates. You never know where Cacoo will take you next!